Do radioisotope methods yield trustworthy relative ages for the earth’s rocks? Radioisotopes and the Age of the Earth (RATE) research provided multiple lines of evidence that nuclear transmutation rates were dramatically higher during intervals in the past than they are observed to be today. This implies that the assumption of constant rates throughout Earth’s history, used routinely by radioisotope dating laboratories to translate isotope ratios into time, is inappropriate. Yet the question remains as to whether such measured isotope ratios might nevertheless provide valid indicators of relative time. If nuclear transformation rates at every instant are uniform throughout the earth—and there seems to be nothing to suggest otherwise—the answer seems to be yes. For creationists, a trustworthy means for determining relative ages of rocks is a tool of immense value in unravelling the earth’s physical history and gaining insight into the processes involved. This article encourages creationists who previously have been hesitant to exploit this tool of radioisotope measurement to begin to apply it to good advantage. For most scientists the standard geological timescale, with its millions and billions of years, and radioisotope dating are almost synonymous. The reason is that radioisotope methods applied to volcanic tuff beds, lava flows, and igneous intrusions within the sediment record serve as reference points from which the entire chronology can be constructed in what is believed to be a reliable manner. Since it is generally taken for granted that the radioisotope methods provide an absolute reckoning of time, there is a high level of confidence that the resulting geological timescale is absolute in its dates. There is obviously a gigantic discrepancy, however, between the standard geological timescale and the timescale for earth history found in Scripture. Because of this discrepancy, there has long been a tendency for creationists not only to reject the standard geological timescale with its millions and billions of years but also the radioisotope methods that undergird it. However, as creation scientists became more familiar with the issues, especially during the 1980s and 1990s, it became increasingly apparent that existing critiques of radioisotope dating were seriously inadequate. The ‘elephant in the room’ issue was the staggering amount of nuclear transmutation of parent elements to daughter elements that radioisotope methods had revealed to have occurred over the course of earth history. In July 1997 a group of seven young-earth scientists joined together to address the problem that such large amounts of nuclear transmutation seemed to pose to defending the Bible’s account of earth history. This group, which became known as the Radioisotopes and the Age of the Earth (RATE) team, undertook eight major research projects, the technical details and results of which are presented in the RATE final technical report.1Summarized in a few brief words, RATE found multiple lines of objective radioisotope evidence that nuclear transmutation rates had not been constant over time, as widely assumed, but had been dramatically higher during (probably only two) brief episodes in the earth’s past. Although RATE examined 14C, the focus of this article will be on radioisotopes with long half-lives, so discussion of 14C is not included. One of the important implications of the RATE research is that, while the dates which radioisotope methods give under the assumption of constant transmutation rates obviously cannot be correct, the relative dates from a large fraction of these determinations nevertheless might well be valid. What is meant here by the term ‘relative’? It simply means that if basement granite at a locale in Wyoming has a uniformitarian radioisotope age of 2.7 Ga and, using the same radioisotope method, basement granite at a locale in New Mexico has a uniformitarian radioisotope age of 1.5 Ga, then there is a good chance that the Wyoming rock cooled and crystallized before the New Mexico rock. That is, the Wyoming rock has a greater age relative to the New Mexico rock. Similarly, if a basalt flow in India has a radioisotope age of 65 Ma and melted rock from an impact crater in Mexico also has a radioisotope age of 65 Ma, then there is a good likelihood that the two geological events happened near to the same time in earth history, even if they were, in actuality, during the later stages of the Flood, less than 4,500 years ago and only a day or two, or even hours, apart. The logic for the conclusion that standard radioisotope ages imply correct relative ages is based simply on the spatial invariance of the laws of physics governing nuclear transmutation. There are no observational clues or any theoretical reason to suspect that these laws have varied from place to place on the earth during its history. Although conceptually possible, there are no observations of which I am aware that would lead one to suspect that God has not caused His laws to operate in a spatially uniform manner over the entire earth. Radioisotope dating methods seek to measure as accurately as possible the cumulative amount of nuclear transmutation that has occurred in a sample since some crisis point in its history. Radioisotope dating methods seek to measure as accurately as possible the cumulative amount of nuclear transmutation that has occurred in a sample since some crisis point in its history. Common crisis points are when the rock crystallized from a melt or when the isotopic compositions of its minerals were altered via heat and/or pressure in some sort of metamorphic event. What is actually measured is not time. Rather, it is the fraction, F, of parent atoms that have been transmuted into daughter atoms since a certain point in a sample’s history. The standard approach used by all radioisotope laboratories today is to make the uniformitarian assumption that the parent isotope’s half-life, T½, has always had today’s measured value. The formula T = T½log2(1/F) is then used to translate the measured quantity, F, into the sample’s uniformitarian age, T.2However, when the same radioisotope method is applied, the relative age of two samples depends only on their relative F values. Relative age is entirely independent of whether the half-life has been constant in the past or not. The RATE research provided multiple independent lines of observational evidence that transmutation rates were indeed orders of magnitude higher in the past than they are measured to be today. The clearest, most direct line of evidence was that of high levels of radiogenic helium retained in zircon crystals from granitic rocks from a northern New Mexico drill core. The U-Pb uniformitarian age for these zircons was 1.50 Ga.
Another powerful independent line of RATE evidence concerned the phenomenon of radiohalos, also documented in chapter 3 of the RATE final technical report.4 In a herculean effort, Andrew Snelling, the principal investigator of this project, obtained samples of granitic rocks from some 58 different physical sites around the world, yielding a total of 109 separate samples which he subsequently processed and examined for radiohalos. Scanning up to a hundred biotite flakes per microscope slide and usually 50 microscope slides per sample, Andrew documented an astonishing total of more than 31,000 individual radiohalos from these samples. Of these, more than 19,000 were Po radiohalos. Figure 1 is a photo of a 238U halo and a 210Po halo in a single biotite grain from a sample of Flood-aged Encounter Bay Granite in South Australia. The very existence of even a single Po radiohalo is extremely difficult to explain in a uniformitarian framework because the half-lives of the eight Po isotopes are so short, ranging from 0.305 microseconds for 212Po to 138.38 days for 210Po. How could these isotopes possibly exist in sufficient concentrations for their emitted alpha particles to produce visible damage pattern? About the only conceivable way is for these Po isotopes to be direct nuclear-decay products of a nearby concentrated quantity of a long-lived parent nuclide such as 238U. Indeed, the high concentrations of 238U that commonly occur in zircon crystals do occasionally produce a 238U halo with 218Po, 214Po, and 210Po rings, with the zircon crystal at the halo’s centre. But finding Po halos with none of the other five rings from the 238U decay chain, nor any central zircon is not simple to explain. Yet this study identified more than 19,000 of them. Figure 2. Spontaneous fission tracks visible on the polished and etched surface of a zircon crystal from the Peach Springs Tuff near Kingman, Arizona (from Vardiman et al.1). In granites, zircons are commonly hosted within larger crystals of the mineral biotite. At temperatures above about 150°C, the damage produced by emitted alpha particles in biotite is annealed, and so above that temperature radiohalos cannot form or be preserved. The RATE study concluded that some very special circumstances had to prevail in order for 218Po, 214Po, and 210Po radiohalos to form. One clue was the fact that such halos seem to be especially abundant at the core of granitic plutons, which are partially molten granitic intrusive bodies that quickly cool and crystallize in the crust. This clue seemed to point to the fact that the setting in which the Po halos form is that of the final stages of cooling of a granitic pluton after its temperature has dropped below the alpha particle annealing temperature. It is well known that a significant amount of water is released and is present during this stage of a pluton’s cooling history. These RATE findings point to significant quantities of 222Rn from the decay of 238U, together with the Po decay products of 222Rn, having been carried by the hydrothermal fluid in this context through the biotite cleavage planes. Po is selectively deposited from solution at lattice defect sites in the biotite. Pb, into which Po decays, serves to trigger precipitation of more Po from solution in a positive feedback manner. This allows a large enough number of Po atoms (on the order of 108) to concentrate at a single defect site for a mature Po radiohalo to develop. However, this scenario demands an extremely high rate of 238U decay because the time window from when the temperature of the cooling granite falls below 150°C until the temperature becomes too low to sustain the hydrothermal flow is so short—estimated to be no more than 10 days. The RATE team considered the presence of so many Po radiohalos, with no central zircons, together with the geological context in which they were found, together with the chemical and physical requirements involved with radiohalo formation, to represent a compelling case for a massive amount of accelerated nuclear decay, particularly during the Flood. How much nuclear transmutation has actually occurred? It is worth emphasizing that the helium still present in the zircons studied by the RATE team from the drill core in northern New Mexico as well as the 238U and Po radiohalos documented in tens of separate granite bodies from around the world represent tangible, physical, and nearly indisputable evidence of vast amounts of nuclear transmutation; much more than a few thousand years’ worth at presently measured rates. But many creationists have struggled, and continue to struggle, with whether or not this can honestly be true. Indeed, that very issue loomed large as the RATE team first met together in the summer of 1997. It was only after a vigorous grappling with the observational evidence, especially evidence involving fission tracks, that the entire team came into agreement that the physical observations do strongly support the conclusion that billions of years’ worth of nuclear transmutation at present rates has truly occurred since the earth’s rocks first came into being. The research also included an analysis of zircons from volcanic sediment in the uppermost member, known as the Brushy Basin Member, of the Jurassic Morrison Formation in southeastern Utah. Andrew Snelling was the principal investigator on this project and also the author of this chapter. The cleanest results were from a volcanic pyroclastic flow deposit known as the Peach Springs Tuff, surrounding Kingman, Arizona, near the top of the regional sedimentary record. Figure 2 shows fission tracks in the polished and etched surface of a zircon grain from this welded tuff deposit. Note that each of these tracks represents a visible, physical record of the damage caused to the zircon crystal lattice by the high-speed fragments of a 235U atom that has spontaneously split apart. Together the two fragments carry away about 167 MeV of kinetic energy when such a fission event occurs. How many fission tracks did these analyses reveal? Was it merely a few thousand years’ worth at presently measured rates of spontaneous fission of 235U, or was it much more? Based on careful analysis of 20 zircon grains from each of the two samples collected near Kingman, Arizona, the laboratory with which RATE contracted to perform analyses found 20.9±0.9 and 20.9±0.8 Ma worth of tracks, respectively, for the two sets of 20 grains. These fission track results were in reasonably close agreement with the radioisotope results of 17.3±0.4 to 18.7±1.5 Ma already published for this formation. However, in the case of the fission track analysis, the evidence is in the form of physical tracks of damage, as the fission fragments exploded apart in opposite directions with kinetic energies on the order of 80 MeV each and created cylindrical zones of disordered structure in the surrounding crystalline lattice. The research also included an analysis of zircons from volcanic sediment in the uppermost member, known as the Brushy Basin Member, of the Jurassic Morrison Formation in southeastern Utah. Four samples involving a total of 77 zircons from sites near Blanding, Utah, and Montezuma Creek, Utah, gave an average of 141±8 Ma worth of fission tracks (at today’s spontaneous fission rate for 235U). It is noteworthy that previously published radioisotope results for these same rocks averaged 149±0.6 Ma worth of nuclear (K-Ar) transmutation. Since high temperatures cause fission tracks to anneal and disappear, the fission tracks in the zircons from these volcanic Morrison sediments must have formed subsequent to the eruption after the ash had cooled. The dramatic difference in the density of fission tracks, normalized by the uranium content, between the Morrison zircons and those from the Peach Springs Tuff argues powerfully that over 120 Ma worth of 235U fission, at today’s measured fission rate, occurred during this later stage of the Flood alone. It was this fission track evidence that finally convinced everyone on the RATE team that vastly more nuclear transmutation that just a few thousand years’ worth at present rates had occurred during the earth history. So just what did the overall record on nuclear transmutation look like? The large amounts of daughter products in crystalline rocks below sediments laid down by the Flood suggested that significant amounts of transmutation might have also occurred during Creation Week. Yet some on the RATE team were uncomfortable with that possibility. Much of the process for resolving that issue involved our giving attention to the crystalline rocks of the continental crust, as we investigated when these rocks formed and what their subsequent nuclear transmutation histories had been. What do the zircons tell us? One particular mineral has proved to be especially well suited in recording the history of nuclear decay in crustal rocks. This mineral is zircon, or zirconium silicate, ZrSiO4. It occurs in igneous rocks as a primary crystallization mineral, in metamorphic rocks as a result of recrystallization, and in sedimentary rocks as detrital grains. Uranium and thorium are commonly present at hundreds of ppm concentrations via replacement of Zr4+ ions by U4+ ions and Th4+ ions in the crystal lattice. Figure 3. 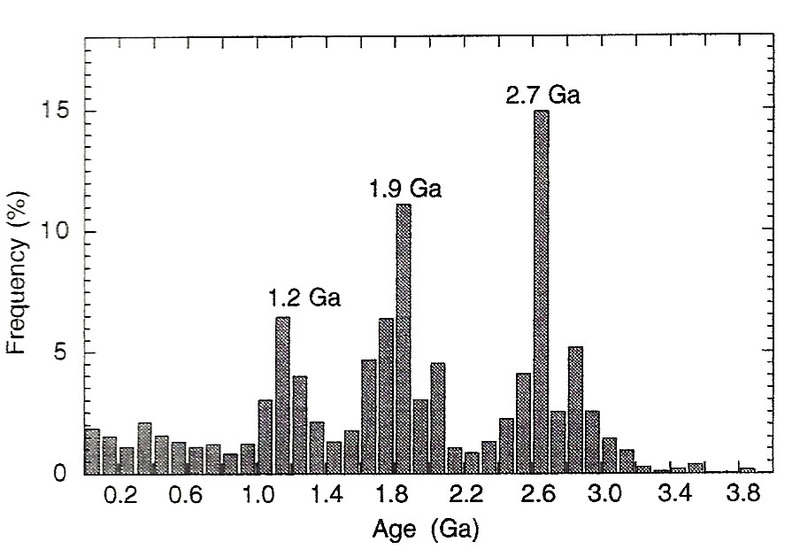 Distribution of U-Pb zircon ages of juvenile continental crust from a compilation by Condie (1998) from all the continents by a large number of investigators. Peaks correspond to intervals of rapid formation of continental crust. (From Condie10.) Click for larger view. Figure 4. 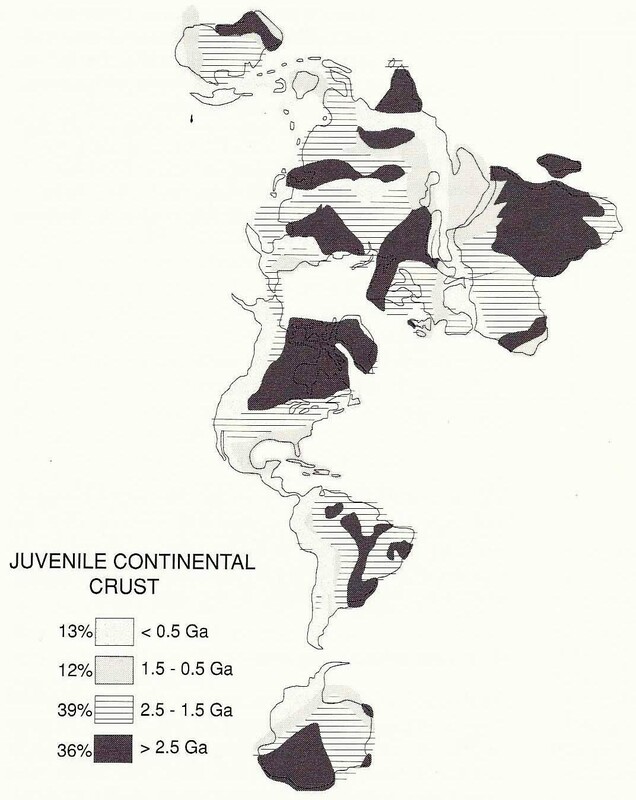 Areal distribution of juvenile continental crust as a function of age on an equal-area projection of the continents (from Condie11). Click for larger view. By contrast, Pb2+ is almost entirely excluded because of its larger ionic radius and its 2+ charge.8 For this reason zircon contains essentially no lead at the time of its crystallization. Moreover, zircon is physically hard, 7.5 on the Mohs hardness scale, and has a high melting temperature, >2000°C.9 Zircons therefore are like rugged time capsules which retain their U and its daughter isotopes extremely well. Because initially there is essentially no Pb present, all the Pb at later times can reliably be interpreted as the direct result of U and Th decay. These facts together make zircon an extremely important recorder of the nuclear decay history of rocks. Because zircon is a primary mineral incorporated into the structure of an igneous rock when it crystallizes, a zircon can record a rock’s nuclear decay history all the way back to when it crystallized, provided there has been no subsequent metamorphic event to interfere. Many continental granitic rocks outside the tectonic belts appear not to have experienced any significant metamorphism in their history. A closely similar distribution of zircon U-Pb ages to that of figure 3 has also been discovered in detrital zircon grains in the river sands at the mouths of the world’s major rivers. These zircons are derived from eroded granitic rocks of the continental crust within the river drainage basins. Rino et al.,12 for example, measured and catalogued the U–Pb ages for about 1,500 detrital zircons from sands recovered at the mouths of the Amazon, Mississippi, and Mackenzie rivers. The distribution in age of these zircons, like figure 3, has prominent peaks at 1.9 and 2.7 Ga. Also noteworthy was the discovery of a detrital zircon in a metamorphosed conglomerate from Jack Hills in Western Australia with a U-Pb age of 4.40 Ga.13 Structural and isotopic properties of this zircon imply that it also was derived from granitic crust. How do the nuclear transmutation data connect with biblical chronology? What do these radioisotope determinations tell us about when this vast amount of nuclear decay occurred relative to biblical history? First of all, it is crucial to have a trustworthy radioisotope anchor point for the onset of the Flood. Most creationist geologists point to the widespread erosional discontinuity commonly known as the Great Unconformity as marking the Flood’s abrupt onset in the rock record. What then do we make of dates that are far in excess of 550 Ma? In other words, when in the Bible’s account of earth history could the nuclear transmutation in rocks that display uniformitarian ages of 1 Ga, 2 Ga, 3 Ga, or even 4 Ga, as displayed in figures 3 and 4, have taken place? Portions of the granitic crust today display little indication of having been modified in any significant way by metamorphism since it originally crystallized. In such rocks the U and Th in primary minerals such as zircon and monazite as well as the K in orthoclase (KAlSi3O8), or pink feldspar, trace their history all the way back to when these rocks formed. In terms of biblical chronology this would be prior to sometime on Day 3. But when did the large amount of nuclear transmutation, as indicated in figure 4, unfold? Because of the radiation involved, the RATE team concluded the only defensible possibility was also prior to the point on Day 3 when God began to create vegetation on the dry land. This implies that a vast amount of nuclear transmutation accompanied God’s supernatural creation of the earth, including its continents. Chemical evidence strongly suggests that God extracted the continental crust, with its large inventory of U, Th, and K, from the earth’s mantle rock by a chemical differentiation process.15 During a brief span of time—the Genesis text allows only tens of hours—God not only brought the continental crust into being, but also caused several Ga worth of nuclear transmutation to unfold within its rocks. Their zircon time capsules preserve this record with amazing fidelity. Somehow God also disposed of the heat released, such that later on Day 3 all sorts of lush grass and herbs and fruit trees were flourishing over much, if not most, of the land surface. The RATE research, not only the fission track work and radiohalo work, but also thousands of radioisotope determinations by secular earth scientists, indicate that an additional 550 Ma worth of nuclear transmutation also unfolded during the Flood cataclysm. How does one reach this conclusion? It is primarily by inferring that almost all the rocks lying above the Great Unconformity represent catastrophic geological activity associated with the Flood. Although there is debate among creationists concerning just where in the record the Flood/post-Flood boundary lies, my own conclusion is that it is in the Pliocene, when rapid uplift of today’s major mountain belts began in earnest16 before the onset of Ice Age glaciation. This implies that all of the nuclear transmutation from the Great Unconformity to about 3–5 Ma on the uniformitarian timescale occurred during the Flood. Somehow God removed the heat and protected the living things that survived the cataclysm from the associated radiation. This transmutation process left behind a clear and readable record, including the radiogenic 206Pb, 207Pb, and 208Pb isotopes, helium, and fission tracks within zircons, as well as an abundance of radiohalos. As a side note, a radioisotope date of 3–5 Ma for the end of the Flood in the Pliocene implies that the accelerated nuclear transmutation associated with the Flood proper must have also continued through the Ice Age to the point at which rock ages given by radioisotope methods yield values of only a few thousand years. Transmutation rates almost certainly were also decreasing rapidly during that interval to reach the values we measure today.